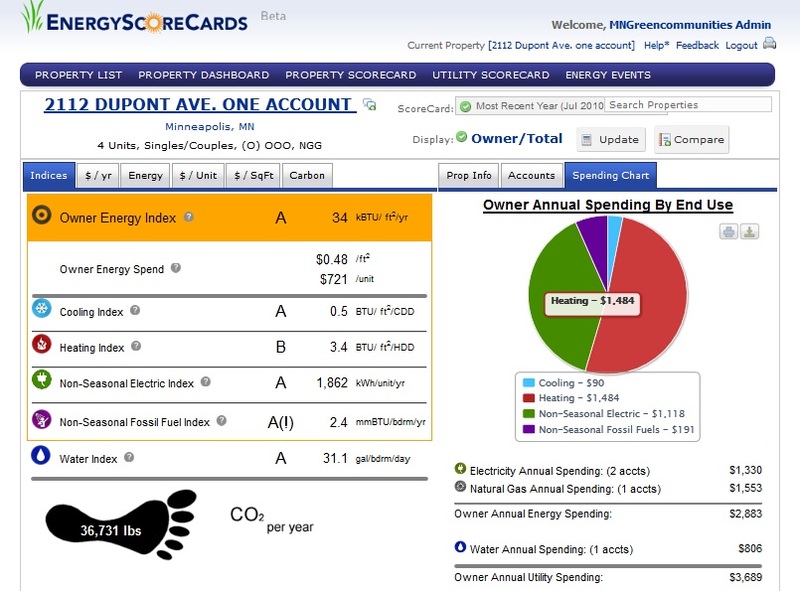 As one step towards addressing some of those challenges, multifamily buildings in Xcel, CenterPoint, and a few other utility service territories will have free access to an online benchmarking tool, EnergyScoreCards. Huh? Benchmarking? In essence, EnergyScoreCards has a database of ~2500 multifamily buildings that includes the actual utility consumption and some key building characteristics of those buildings. They then do some fancy data analysis on the whole thing and figure out – for a specific type of building – what is typical usage, what is high, and what is low. When you add your multifamily building to their database, they give you a grade, and voila – you know whether your building has accessible opportunities to conserve! The report card breaks things out into heating, cooling, baseload electric (stuff you plug in), baseload gas (most often hot water heaters), and water. If you get a bad grade in a category, that’s where to invest. There’s lots more info in the tool, including financial context. In a relatively small building, if you get a D (it’s only A through D, so I think of D as failing) in cooling, but also only spend $500 on cooling in a year, there’s probably not enough payback to justify investment. However, if you get a C on heating and spend $5,000 a year, there probably is. That seems like a pretty good start – owners and managers will finally have access to information about how their buildings compare to other buildings, and a sense of where to invest. That’s big. Finally, in my fantasy world, property owners will market their buildings as efficient (& provide back-up data for the claim) AND tenants will demonstrate a preference for efficient, utility-affordable homes. Pilot project partners include Minnesota Green Communities, EnergyScoreCards, Minnesota Housing, Center for Sustainable Building Research, and CEE. Posted on Thursday, December 8, 2011 by Janne Flisrand. This entry was posted in Green Building and tagged energy efficiency, multifamily, study, water conservation. Bookmark the permalink.